Tinnitus is a common yet often debilitating condition. It manifests as a near-constant ringing or buzzing sound in the ears and is mainly caused by long-term exposure to noise. People who work in factories, airplane hangers, concert venues, or construction often suffer from combined hearing loss and tinnitus. While there is no cure for the condition, wearing hearing aids for tinnitus can be effective. Keep reading to check out Audicus’ complete guide to understanding and managing tinnitus. Tinnitus can be temporary or permanent. Many of us have experienced tinnitus—that ringing sound after a loud concert, for instance. For most people, it goes away after a few hours or a day. However, permanent tinnitus is a serious and painful condition. Recently, tinnitus has gained some attention via the summer flick Baby Driver, which featured a main character who constantly listens to music to combat his tinnitus. Most tinnitus is caused by prolonged exposure in noisy environments, which is why it goes hand-in-hand with hearing loss. However, tinnitus can also be a side effect of aging or caused by ear infections or diseases. Very rarely, tinnitus can come about after using certain medications. Tinnitus can be difficult to diagnose, but it is a very real condition. You might be the only person who hears the ringing but it’s possible to get a diagnosis and some relief. As mentioned previously, there is no known cure for tinnitus. There are several different ways to treat and lessen tinnitus so that people with the condition can live fairly painless lives. Many people with tinnitus find that listening to soothing or white noise helps to mitigate the ringing sounds. Check out Audicus’ custom playlist for tinnitus here. There is also a treatment for tinnitus that is a bit more involved. 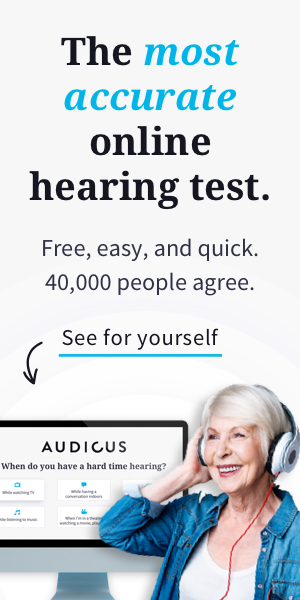 Based on a recent study about tinnitus and frequencies of sound, a company called AudioNotch developed online software that can help alleviate tinnitus. It determines the frequency of your tinnitus and creates custom sound therapy that filters that frequency out. Users have found that the volume of their tinnitus decreases after several weeks of sound therapy. Can hearing aids be used for tinnitus relief? Since most people with tinnitus also have hearing loss, many tinnitus sufferers are already using hearing aids. Hearing aids allow wearers to hear sound they might be missing, which can effectively mask a lot of the tinnitus ringing. When you’re able to hear everything going on around you the tinnitus doesn’t sound so loud. Additionally, tinnitus masking can be programmed to hearing aids and help alleviate symptoms. Audicus offers tinnitus masking for the Clara RIC hearing aid model as well. However, this is not a standard feature so be sure to call or email to let our hearing specialists know you experience tinnitus. According to the American Tinnitus Association, a 2007 survey found that approximately 60% of tinnitus sufferers found some relief with hearing aids. In addition to masking the sounds of tinnitus, hearing aids increase stimulation between the brain and the auditory pathways. This may cause a reduction in tinnitus symptoms. Hearing aids also have volume controls which could allow users to make their environmental sounds louder than their tinnitus. Hearing aids for tinnitus could be an effective treatment for you! I have tinnitus,but my hearing is great will ear aids help to get rid of the annoying sound! Is there a hearing aid that helps with tinnitus while having almost perfect hearing??? Our hearing aids can be custom-programmed to include tinnitus masking which can help alleviate the symptoms. Our team would be happy to discuss your hearing needs and what we can do for tinnitus. Feel free to call us at (855) 971-0451. We’re all ears! Will the Audicus Clara RIC reallyy help eliminate tinnitus noises. These sounds prevent sleep and annoy me all day long. Will this product help solve those problems? Hi Carol. Our in-house audiology has a lot of experience with programming tinnitus making programs. The best way to know if this would be a good solution would be to talk to one of our audiology assistants about your experience and the options we offer. Feel free to call at (855) 969-4928.
about a month ago I started hearing music when there wasn’t any music and I hear a buzzing sound like a dryer buzzing off all day long who do I go see since there really isn’t any treatment for it? My tinitus is so loud i cannot hear the smoke alarm even if i am standing under it. I had normal hearing aids but they made no difference. Would your hearing aids be different. I dont see how u can tune them when my noise is always changing.also it affects my balance. Hi .tinnitus seems louder when i take hearing aids out .for example before bed . It seems worse the following morning too . Have tinnitus seeking relief to mask the agonizing sound. This article stated “tinnitus masking can be programmed to hearing aids and help alleviate symptoms.” Is this possible with the Audicus hearing aids? It is. Just call and let our team know that you have tinnitus and would like a masker.